Her layered speculations took a while to unravel. Considering that she had a sinking suspicion she'd seen the mask in a memory that wasn't her own, she first suspected the cultists. With no one else to rely on, but fellows of the holy institution of the church, she decided to test her theory by asking around. She'd made a list of potential folks she could ask, Adelaide had been high on the list, but she really didn't want to bother the poor mother with any sort of responsibility that would force her away from her broken family. While finding out what that posse was up to, was of utmost importance, she would resort to burdening her former mentor, only when there was no other way. She settled for the next best option. The very old and very wise defender-of-holy-texts, by the name of Benedetta. The title was essentially a more glorified way of calling her a librarian for the Church's vied collection. The Shimada was certain that the woman would have more insight on the matter. She certainly didn't want the lady, known as to suspect her of anything, so she merely described the mask to the old woman, under the guise that she'd heard a suspect talking about it while she was still more solidly amidst the Rune Knights. The librarian was almost too quick to establish that it was these fabled cultists that haunted the lands. She went out of her way to show her inscriptions upon inscriptions of accounts that corroborated her deduction... It was a little too... perfect and easy. Maybe Akira was thinking zebras when she heard horse hoofs, but things were adding up way too neatly. Upon closer evaluation, she began wondering if the church had collected this much knowledge, what was to stop them from using the mask as a ruse? It could in fact be someone from within the church that had orchestrated the episode that she and Kazi had interrupted. If so, they'd really taken quite a few measures to keep the blame off of the religious institute. No surprises there. After using the prayer time to ponder some more, the Shimada left the grandiose abbey, with a puzzled mind. Now going as far as to wonder if they'd left the mask there intentionally to send anyone who chanced upon them on a wild goose chase. She'd taken a few days already, she didn't want Kazi to think she'd betrayed him, nor did she want him to deem her incompetent. So despite not having the concrete answers she had promised, she'd beckoned for him to join her, so they could discuss the matter further. She wasn't too keen on letting him know of her unverified suspicions yet, especially because it was in the interest of her mission to aid the Church, should her suspicions be true, to gain their trust. For the moment, she decided it was safe to repeat what she'd learned from Benedetta. She decided to test Kazi's mettle once again, by choosing to meet at the famous church, despite, or rather because she was aware of LeeAnn's discomfort. She wanted to know if he'd have what it took to put duty first. The Shimada made that sacrifice everyday... It was time someone shared that burden with her. Not only did it aid in learning more about his inclinations, it made her new affiliation clear to him. While it was a risk to be seen in association with another Rune Knight, Kazi was hardly established enough yet. It could be seen as a gesture made out of habit. Kazimir was finishing getting himself together as he awaited Aki's call. He kept the next few days open and simply did some training seeing as how they may be going into a dangerous situation. He didn't mention his task to anyone. An attempt to avoid any uncomfortable conversations. An easy task considering how infrequently he was at headquarters and interacted with the other knights. Even after his promotion no thing seemed to really change much. Maybe he just didn't pay enough attention to what was going on. He wondered what sort of contacts Aki was using to get the information, but never doubted that he would hear back from her. If nothing else he would have been surprised if he didn't or would have assumed she ran into trouble. Almost on cue someone not affiliated with the rune knights tracked him down, "She is waiting for you at the grand church of Illumin," the man said. Kaz almost gave out a sigh not at the idea of going to the church but the long winded introduction of the church. "Alright then. Thanks," answering politely and heading out toward the church. He had never stepped foot in a church in his life. Religion never came up in his clan and nothing about drew him in yet. It was on his list of things to do, if nothing else to satisfy his curiosity and need to learn. The church was as magnificent as people describe it to be. At least those without a bias against the organization. It may just be deserving of such an introduction, although he would never be man to prey to anything other than the spirit that gifted him his magic. And even then, that was rare. He walked up the pristine steps. It was a domineering presence even to the devote. Commoners and priests moved about around him. Both coming and going from the cathedral. Some faces heavy-hearted and others with a smile of prays answered. He knew he would never be able to come here with LeeAnn so it was probably for the best that she didn't accompany him on this task. Not to mention the distress of her running into Aki again. The wind mage understood this had to be a covert operation. Given Aki's standing he may have to ignore some of the details in his report. What was important to him was always the mission and doing whatever was necessary to ensure the safety of the people. he was eager to hear whatever Aki had learned. Maneuvering around robbed priests he skirted the outside wall. Trying not to draw attention to himself or disrupt the countless people in solemn pray. A minister chanted a hymn, more like a deep and resonating hum. The people bowed their heads and some rose their hands to the heavens with tightly shut eyes. Eventually he found Aki standing alone in an off shoot corridor. Behind her seemed to be a rather expansive library. "Aki...So what are we walking into? I take it what you found has something to do with the church," he asked passively, without antagonistic intent, but searching for the reason this place was chosen. His eyes slowly looking around to take in all that could be seen. It was easy to see he felt curious about the place instead of discomfort. A feeling that came from his lack of interaction with such an establishment. He had a million questions about the place but pushed them to the side and stayed focused on the matter at hand. It was even more curious that her search brought her here. He was unsure how he felt about possibly working alongside the church. She stood atop the pristine grandiose staircase, lost in the bustle of the crowd that ventured in and out of the building. She gauged the man as he approached, choosing to turn away just before he got close enough to address her and leading him to a passage that was less disturbed by the constant influx. She noticed his grudging admiration for the architecture, one that she and Tsuru shared as well. While she could appreciate the effort, she judged the unfair opulence. She could never understand how the poor and the downtrodden could maintain faith in such an organisation. The Holy Church, definitely spent more of its earnings on maintaining the splendour of their institution, and the illusion of power, than it did to help. While any logical person would derive such a conclusion especially after the Incursion having left this particular building absolutely unharmed, the system had already buried its roots too deep. Most such occurrences often worked in their favour rather than against. With that line of thought, she grew curious about Kazi's past, but like most questions, those inquiries would have to wait for a better time. As he neared, yet again, she turned to face him again. The sharp light from the main hall in poured into the dimly lit passage, creating domineering shadows of the two figures as their tense tryst commenced. She realised she was wringing her hands which only worsened when he jumped to the conclusion that she thought the church was involved somehow. She quickly clasped them behind her back, to not betray her anxiety and doubt, to attempt putting up a bolder more reassured front. 'No.' she said, putting redundant amounts of emphasis on the denial, which could've potentially given her true deductions away. 'I called you here, because now that my time with the Knights is drawing to a close, I've opted to work with the church. Fitting, given the demonic threats we face, isn't it?' while her words and tone attempted to resonate with some sort of a passion, there was a dry underlying flatness to her claims, that she hadn't been able to get rid of yet. She left her deceleration with a question, just to offer him the chance to share his reservations should he have any and should they get in the way of the mission they were meant to undertake. 'It is as I feared, notorious cultists plague the lands and they have some ulterior motive.' she explained. It wasn't too tough to conclude and imply that they were scavenging the sites of the incursions, potentially for left overs of Abyssinian artefacts, or even powerful equipment left behind by heroes who had fallen while defending the land. She explained these simply derivations, unsure if he'd be sated, given the time she'd taken. She could just hope that he'd continue to show his usual deference. There was a chance he wouldn't, since the difference in their ranks was no longer something that could technically feature in their interaction. 'I have some clue as to where they might be, shall we go?' she said, opting to lead the way. Luckily, she did have a sneaking suspicion as to where she could find this covet group. From what she'd gathered, cultists and the experimenting Holy Knights alike, favoured decrepit ruins of seemingly abandoned churches. There were quite a few of those littered around in Orchidia. Perhaps, they two would have to scour a few before chancing upon the right one. Aki seemed to ponder the deeply interwoven threads of the church's role more than he. Haru had mentioned she was healed by the church, but was that truly all it took to bring someone to bow in prayer. What had they done to her? perhaps bring her back from the brink of death. He ran his hand along the sleek marble wall one step behind Aki. Would he walk these halls if it had done the same to him? Maybe if he had been born here. His fingers drifted away from the cold marble. It was no matter. His path was already set and his history told. Coming to a halt she was ready to address his inquiry. Their shadows danced along the walls only obscured by the flickering of holy candles burning beneath patron images. Upon hearing his question, she hastily clasped her hands behind her. An anxious move or a nervous one, he was not yet sure. She reassured him the church was not behind it. Moreover that she stood with the church now. He words were sounded like a soldier recited what they had to in order to get by. I ring of hollowness in them, or so he thought. His eyes creased giving away the skepticism he felt about her statement. "Interesting. So that means coming here was all just a way to make your long-term position clear to me. To clear whatever confusion there may be," Kaz no longer felt the need to mince words or beat around the bush. He knew Aki liked to test people and was at least partial settled on that being the case here as well. "I suppose I'll do the same then," he replied nonchalantly. "I know there is a history between the church and the rune knights. One I was not a part of. Knights, churches, guilds, this land is littered with titles and affiliations. I only care about standing against evil, protecting the innocent...and those that stand alongside me. Regardless of your path, you will always just be Aki to me. The Demons threaten us all." It was a long winded response but Aki was forward and clear with him which was a valued trait. He hoped his words were not too abrupt. For him improvement and upholding the safety of people were what mattered most. Not any of the tangled confusion of organizations and convoluted allegiances. "Although i would be lying if I said I wasn't curious as too what spurred your decisions. Whether it was demon's alone," he adopted a moderately warmer tone despite the brazen curiosity in his eyes. He left the question in the air for her to take and do what she wanted with it. Once they cleared up whatever needed to be said on that subject, Aki explained the whole situation with the cult. The more she elaborated the darker it became. "I never expected it to run this deep. Who knows how many lives are endanger from tampering with demons." It was impressive how much she was able to gather in such a short amount of time. From only a mask she was able to put a group to the crimes and a motive. "Do you know anything about their end goal?" It was a long shot question but he had to ask on the off chance. She asked if he was ready to go and he was a bit unused to her asking if he was ready. She was already settling into her position with the church and out of her role with the rune knights. Kaz nodded, "I'll follow your lead," he said reassuring her that things had not changed for him. He followed her out and around to a scattering of old ruins and broken down churches. She knew the area well and had a thought out list of places to attend to. Most of them unpromising and they came upon yet another that looked scarce. It had been a few hours of walking between the churches and the ruins they were at now showed no signs of activity either. Kaz brushed away some webs that clung to the crumbled columns and ragged doorway. "Seems this one is out too. How many are left?" He asked while rubbing his hands together in the cold winter eve. Her eyebrows immediately shot up at the change in his tone, which was far more brusque than before. So all it took was her to officially leave her rank for his alleged regard to fade? or rather, vanish? She drew a long breath in, resisting the urge to click her tongue, she did tap her feet though, gently and impatiently. 'Yes.' she said, with a certain sharp finality. Her test did serve its purpose then, he did go onto make his allegiance very clear, which, much like her ex-partner, was towards the people. Her own efforts were directed in a similar direction after all, they just had a more convoluted path. Aki was surprised at her own reactions regarding the change in his demeanour. While his faith and deference in the past had ironically left her with warmth and guilt in lieu of her duty, now that there was a dearth of it, she felt challenged and icy. She snickered softly, but it echoed in a rather menacing way in the hall. 'Just Aki, huh? I'll take it. But regardless of where you stand, I will make the distinction of protecting only those who deserve it.' she said, choosing to make her own standing clear. She didn't explain the parameters that made someone worthy, which potentially left this to his vague interpretation. However, Akira wasn't lying for the sake of her mission this time. She did have a way of sorting the worthy from the lot with the wand and she intended on using it whenever she could, surreptitiously though. Intent was her chosen sieve, if someone intended to harm another for personal gain, they were unworthy of her intervention. Perhaps... In time she'd realise that was too harsh a judgement. The change in his tone once again, did melt the frosty tension just a little bit. Aki was not one to begrudge another for long, especially if their intent seemed noble. 'Faith works in mysterious ways, it offers as much as it takes away, I suppose I was just the lucky to be among the former.' she replied, attempting to sound somewhat wise. She didn't have it in her to favour the church extensively in the given moment, especially as suspicions against them stood stark. He reminded her of how deep the illusion ran, simply in response to the little that she had shared. She wrung her hands again and shook her head about the end goal, not trusting her words or tone. She'd heard whispers about a certain section of the Church experimenting on unwilling victims... And all of these things in tandem with one another, didn't bode well. She lead Kazi, their ventures and investigation mostly lead to disappointing conclusions. There could've been powerful cloaking magic and such in use, but Aki had no way of sensing such things. Feeling woefully disappointed at not making any headway, her frustrations seemingly oozed from ever pore in her body. 'Still quite a few to go.' she said, unclenching her jaw just in time to prevent the words from being issued through grit teeth. Just as they were about to walk away though, she heard the crunch of snow behind her, it almost sounded deliberate, given that the place was eerily silent just moments before. Upon whipping around, her gaze fell on a rather smug looking blonde man, in a golden armour. It was clear from the fact that he'd managed to conceal his presence in such totality, that he was no one to be trifled with. 'I'd expected the two of you to have keener eyes.' he said, chuckling. He could tell his words changed her state. She was more guarded. An outcome that he did not intend but no doubt due to the blunt way he spoke at times. Perhaps a poor choice this occasion. He would have to back peddle now and make himself a bit more clear, "Oh, no. I just. You called me Kaz before so I thought," he smiled and looked away, "Akira it is then. And I by no means intend to drive a wedge between us. I simply meant your affiliation doesn't matter to me. We started as allies and we will always be allies. I respected your ability not that you had a title. It was about what you were capable of. That's all." He said looking back into her still icy eyes. "Don't we always decide who is worthy," he shrugged After all he chose to protect the innocent because he deemed them worthy. Who he considered innocent was his decision and not everyone fit in there. Anyone who abused their power garnered ill will from Kaz. He could deal with many things but hated to see the misuse of strength. perhaps that is why he never felt truly at home in large organizations. Her answer was cryptic but Kaz believed many people of church were similar to that. "Spoken like a lady of the faith," he responded without judgement or ridicule, just intrigue. "Perhaps you can tell me more about it sometime. As you know, there is much information I am lacking about these lands," it was as much a show of good will as it was genuine curiosity. He did appreciate her company for whatever it was worth. It was always nice to have someone he considered an ally around. He spoke moving his hands more now to express himself. They were small open gestures but close to his body. A sign of his growing comfort. It was another dead end and it was apparent Akira was not a fan of the endless hunt. "I'm sure we will come upon it soon," he tried to encourage her. "The wind takes time to weather down the mountain," She didn't seem like one to care about metaphors but it came out instinctively. He thought about using his vibration sensing magic to detect anything deeper in but it had a very limited range. before he could start, a presence made itself known behind them. Kaz turned around slowly, upon hearing the snow, and was ready with a spell in hand. A man stood, regal and arrogant. All the markings of someone Kaz was predisposed not to like. His chuckle at their situation made it worse. "Pleasure to meet you, I'm," Kaz was going to engage in pleasantries to be civil even though the man clearly already knew them. "I am aware of who you are. Mr. Seiryu. Ms. Shimada," slowly moving his eyes to meet Aki's. Every word as condescending as the last even without him trying. "Since you know us. Perhaps you could tell us your name and why exactly your here?" The man's presence was uneasy and it already made the situation far more complicated. "Who I am? You will know in time," he strode a few steps to the side, "I am here to bring sight to the blind," a regal grin came upon his face that radiated an equally menacing aura. With a tap of his sword, the area around them seemed to ripple. The same decrepit wall they had over looked now revealed a doorway. It moved itself a jar to show the torch light gleaning through the crack. Kaz looked back at Akira and then to the man. He waited for whatever decision she would make but he knew they were going in. Once again, Kazi managed to melt some of the ice she guarded herself with ever so readily, but not entirely this time. She realised that it would help her keep some healthy distance, it wasn't supposed to like her, if he did, then she wasn't playing her part right. So while compelled, she didn't let him in on the fact that Aki was fine and he need not waste his time with formalities. She remained quiet as they walked, allowing him to offer his opinions on her words. She was surprised he'd interpreted her words so correctly. For the most part, she did mean it in exactly that contest, she just wanted to do her job better and dish out justice accurately. The difference existing in the fact that she wanted to minimise the time wasted on all the paper work, but that was only because she had a fool-proof way of assessing intentions. She was forced to softly add her lie, for the sake of pretence. 'Just and faithful' her words highlighted her what she would allegedly use as sieve to filter the worthy. She offered a curt nod to his assessment of her and as an agreement to teach him more. She did have bookish knowledge, surely that could suffice if their paths crossed often enough for such exchanges. She stifled the urge to smirk when he offered another wind related sentiment, in an attempt to bolster her spirit. Much like Tsuru's presence, his company was oddly calming and supportive. Though the context of the relationships she shared with the two was different, there echoed a sense of familiarity and ease that extended beyond what one would find between colleagues. Despite the thin facade of conflict, perhaps the underlying repose was obvious to the onlooker, the blonde, armoured man, who stood staring down at them like a predator on his prey. While it wasn't surprising that he knew her, her exploits had made her quite infamous over the past few months, it was disconcerting that he already knew Kazi too and that neither of them knew who he was. It was fair to assume that his insight went beyond the usual observer. She narrowed her eyes at their smug opponent. 'Kind. But last I checked, neither of us were blind.' She gasped softly as reality itself seemed to remould and alter as he tapped his weapon, and a derelict wall morphed into a threshold. It was almost as though he was proving a point, that they weren't in fact as keen in sight as they believed. She held up her palm, parallel to the ground, her fingers pointing towards her target. A blade like projection streaked outwards, of course, nor she nor Kazi could see it. The invisible shock-wave never made contact with the armoured man though. Within the instant he sprouted four large wings and shot straight upwards. The wall behind him exploded, there was no door now, just a large gaping hole and a tonne of debris, but that wasn't what held the Shimada's attention. Her eyes were riveted onto the being in front of her. The soft tuft of white feathers that graced his large wings, were perhaps the only gentle thing about him. The rest of him seemed sharp, domineering and fierce. It became obvious that they were dealing with a being superior to them. A Seraphim to be precise, much like the demons... he too seemed to elicit the same sense of doom and dread in the Shimada's heart. There was no room for pretence anymore, it was the two of them together, united against this... beautifully vicious creature. 'Much better.' He addressed her, completely unfettered by her attack. He then turned towards the Sinese, as though politely offering him a chance to attack too. She sneaked a glance at Kazi, to check in. She used the word faithful to highlight her criteria for those that were worthy. 'A curious little word and one vague enough to be open to interpretation', he thought. He wondered what being faithful looked like and how much faith constituted being worthy. Not a question he intended to dive deeper into now. She was on her side and he his. For now they had a common enemy to face down and he knew to little about the church to judge it one way or the other. She offered a simple gesture indicating he would one day teach him what she could about the church. Despite her cold demeanor and the stark performance she gave at the bonfire, perhaps she still regarded him as an ally in some sort. Her frankness was refreshing. She was too the point and guided more by leaning on her logical conclusions and duty than emotions and irrational. It was a trait he respected and gave him a sort of simple pleasure in the remembrance of how he was trained and those from his past that were good-natured but precise. Reality bent around them in a ripple and Kaz planted his feet firmer into the ground not knowing what to expect. A door appeared in a wall along with an arrogant smile on the face of the armored man. Kaz's eyes glanced around in multiple directions trying to get a grasp on the magic that was happening. Every second was filled with another smug remark and finally Akira had enough. She had been collected and cool the whole day but something about this man enraged her. With fists clenched the man prodded at her emotions once again. "Akira, don't let..." before the rest of the words slipped through his lips, the proud warrior beside him lunged in for an attack. In a way it reminded him of another fiery person led to jump at violence. She had come to terms with her magic. A quick motion sent something at the man that he could sense but Kazimir couldn't detect. The man sprouted four angelic wings and took flight. Kaz's eyes grew wide for the first time in the encounter. He couldn't believe what he was seeing. The man floated in the sky as magnificent as any divine being, and with the fervor of a god. The large wall crumbled to pieces from the immense unseen force that Akira released. She definitely wasn't holding anything back any more. This...being really got to her. It soon settled in Kaz's mind that they indeed faced off against an Angel. The thought came more so at the taunting being's gaze at him. Urging him to give anything he could as well. The seraphim said only a single word with pompous weight behind it, "Well," his wings fluttering gently about him unscathed by the thought of any earthly thing. Aki gave Kaz a sideways glance to see what was going through his mind. They did indeed stand together against this affront to their cause. He rolled his shoulders almost shaking off what surprise he had at seeing the angel reveal his true form. Looking back at Aki he replied, "So this is it huh? Demons and Angels...If we have to fight them both then whats the difference." Words that could probably only come from a man raised without religion. To him they were just two sides of the same coin now. Extra terrestrial beings that only cared for a fight. "The difference is something of a scale higher than your insight allows," the angels half sided smirk grew, "but I will guide you," he spoke as if to insects beneath him, staring down from his pedestal. Kaz knew there was no amount of polite words to get around this one. Plus Aki had already attacked and he couldn't let her do this alone. "Here we go then," He said first looking at Aki and then to the angel. He stomped his foot and a stronger gust of wind shot him upward toward the angel. He brought his staff up along with a hand and sent to slashing blades of wind at the being. The angel simply turned his body and dipped below them like dodging a leaf in the wind. Kaz soared upward level with the angel as the wind shot passed him and made a circle with his staff. A breeze surrounded the angel and erupted in the same tornado Aki saw him use before. Kaz had a feeling that wouldn't be much but at least he hit something and maybe Aki could follow up. Before the wind dispersed the figure of the man was clear to see within it. He rose his hand to the sky slow enough that a butterfly could land on it. His hand opened and the raging wind was engulfed in a brilliant fire that whirled around him and scattered like ash from a campfire. "Better than what you were," he spoke without a hint of pain. Kaz landed back near Akira and the Seraphim lowered himself to hover a few meters from them. "Show me more," He waved his sword sending a sheet of flame at the two of them. She heard her comrade's warning, she simply didn't heed it, or rather that she couldn't. It felt as though her newfound magic possessed her, instead of the other way around. That the Seraphim in front of the two mortals seemed to tease out reactions the Shimada usually reigned in with ease. A small part of her at least hoped he'd have a similar effect on Kazi, when he didn't, she grew tense. She licked her lips in a fruitless attempt to bolster her fading sense of courage. Why did he have a hold on her like this? Why was he able to coax such aggression. It was almost as though he had a personal stake and contribution in the way her magical abilities worked. Her gaze lingered on Kazi, her breath was already shallow and she grit her teeth, betraying sourness that she directed more at herself, for losing the usual poise she maintained. Not only did he get her to do what he wanted, he also evaded the attack with ease. The Sinese remained mostly impassive, reflecting what Akira would've been had she not been so easily taunted. She huffed softly as Kazi issued the question on her tongue. Although, they both knew he was hardly the sort to humour them with the answers they were looking for. The angel used it to set himself apart and above them yet again. She could tell Kazi would've avoided the instigation, but he gathered an attack in solidarity with her. She had a way to attempt dissuading him, just like he had done for her. But given the obvious friction between the Seraph and them, the last thing she needed was for him to learn of the powers harnessed by her wand. She watched Kazi beckon his winds to allow him to rise briefly and throw the slashes of magic. The Seraph resorted to making quite a spectacle of his defence. She paid careful attention and made note of his tendencies, hoping that the two lesser beings would find a way to exploit one of them and at least make a get away. While the flare of his defence didn't really impress, something else did nab her attention. It was the way the Seraph seemingly referred to Kazi's past. Her eyes widened at that comment. How long has he been watching and who else had he been watching, surely we can't be the only ones? She thought and was contemplating giving voice to her blunt questions. They were well past the stage of exchanging pleasantries for the sake of formality anyways. What they lacked and were limited by however, was the luxury of time. Soon after the angel finished his sharp assessment, he descended and sent a wave of fire. His attack was a bit of an overkill, there was certainly no precision to it, but that made it impossible to avoid too, especially given their proximity. So instead of trying to get out of the way, she streaked and dashed to cover as much of Kazi as she could. She winced instinctively, but she trusting her orb to protect her, while using herself as a shield for the Sinese. It drew a considerable amount of magical energy from her, but it was worth it. She sighed as the holy fire billowed around them, he sustained them with ease, literally testing them with fire. Using wind could prove risky, as much as there was the potential to blow the flames away, it could also stoke the fire into an inferno. She wasn't sure how her magic would interact but given that she'd eventually run out if she didn't plan a counter, she decided to risk it. She held out her fist, in a gesture similar to the one she'd used the very first time her magic responded to her appropriately. A spectacle that Kazi had the fortune of witnessing. A magic circle appeared and from it a cube emerged. She couldn't see the cube in itself, but the conflagration licking at its edges made its existence apparent. She betrayed a smirk of her own as her orb was offered respite. She grit her teeth as it cube tore through the flames towards the Seraphim. The Shimada instinctively opened her fist in an attempt to gain more control... Instead that caused the cube to rapidly expand till it threatened to touch the sword, the source of the blaze. At least it gave her an idea of her own capability. Just as the wave of fire had raged towards them, it vanished. He reflected her smirk. Even in the face of her defence and retaliation, the seraph looked pleased. It was as though he could draw smug satisfaction from their success and from their failure, like both the outcomes were equally attractive prospects. The seraph had dismissed all of his attack with ease. Kaz landed and meant to gather himself for the next attack alongside Akira but it was to late. The seraph descended with a sheet of red hot flames, blanketing their area. Kaz looked toward Akira, more concerned about her safety than his own. If need be he would launch whatever spells he had to mitigate the wave of heat. He turned his hips with his foot digging into the ground. His weight shifted as he began to push off and dash nearer to Aki. Before he could move, Akira had sped to his side and shielded him. He was never on the side of he one being protected. He always stood ready to throw himself on the pyre, but that chance never came this time. The sudden surprise caused the mage to stumble ever so slightly as he halted his forward momentum. "Akira! What are you!" his shouts of surprise were swept away as the fire hit. Akira's body stood vigil in front of him. The flames matched the intensity of her gaze. Light from the fire danced around her shoulders and flickered against the dark strands of her hair. Some strange magical energy helped mitigate the fearsome attack. She was largely unscathed by the attack as a strange orb she had glowed softly. Kaz wasn't fast enough to protect her or react, but was thankful if not a bit surprised she so gallantly rushed to his aid in concern. It was this moment that settled Kaz's opinion on the woman. It was but a simple task that he cared about from someone to garner his protective nature for them. Simply helping him with a task but Akira risked her safety for him. An act that he would not forget but still ate at him that he was not the one to be there. He accepted her as a genuine ally and one that he would return the favor for. A sentiment reflected in his eyes. "Thank you...Now let's put this guy down," he said with a more determined smile. Without missing a beat, Akira faced the angel and gestured causing a magic circle to appear. Kaz stood up remembering that her magic so far was unseen and he needed a way to fight safely alongside her. He had a plan though that he hoped would work. Clapping his hands together he felt every ripple and vibration in the wind around him. If he could not see her magic maybe he could feel it. Almost instantly her attack dismissed the seraph's self-righteous flames of purification. Kaz took this opening and dashed quickly to the side and spun his staff to create a magic circle behind the angel. Aki's explosion cut through the flames and seemed to reach out to the angel and Kaz caused a whirlwind to shoot at him from behind to pincer attack him. Despite the immense power that Akira unleashed the Seraphim smiled throughout. He was pleased in seeing their survival and retaliation. A twisted satisfaction in the struggle of mortals. "Good Akira. But you are still incomplete," he cut into her magical attack and an explosion erupted around him but only his hair billowed from the blast. Sensing the attack from behind he curled in his wings and spread them out vigorously to knock away the wind attack. With alarming speed the Seraphim dropped to the ground. His feet hovered inches above it and in the blink of an eye closed the distance between himself and Kazimir. He snatched the wind mage up by the robe, lifting him from the ground. The Angel spun and released Kaz, sending him careening into a piece of the ruined wall. Before he hit the wall the Seraphim was already at Akira with a sword strike aimed to clash with her wand. Not with a force to break it but hold it in place so he could speak. Whether he hit or not, His gaze fixed onto Aki, "progressing nicely. But you're healing has left you unrefined," he lowered himself to the ground with the haughty personification of royalty stopping to greet a peasant. "Come now AKi. You became the betrayer for what? Realize what you are truly made of," he swung the sword upward creating a stream of fire that burned toward Aki. Meanwhile Kaz composed himself. The attack was clearly not meant to cause much harm which confused him even more. He took a deep breath, feeling a familiar creeping presence and pushed it back to reenter the battle charging as close to the Seraphim as he could. The Shimada paid little to no heed to the protesting note in Kazi's voice. Akira had hoped that she'd be able to reserve the moment when she displayed the the ample power of her orb. The intent was to use it only when matters got too dire, little did she expect them to get so fiery so soon. There was no choice to make, she couldn't find it in her to risk a fellow Knight, or in fact even a fellow human like that. It was impossible for her to gauge if Kazi had something up his sleeve to evade that. Nor could she deduced just how much damage the man would've sustained if he failed to evade or defend in time. It wasn't a possibility she was willing to callously indulge. Despite the sudden way that the heat of the encounter was amped up and evidence that this Seraphim wasn't taking it easy, he still didn't seem to be going all out either. He was only offering what he expected them to reliably be able to handle. All this while forcing them into circumstances where they were either forced to retaliate. Or eliciting responses by using psychological tactics to elicit the compelling need for them to exhibit their powers to him. What she still couldn't deduce, were this angel's intentions. He seemed powerful enough to overwhelm them should the need arise. Yet, it would seem that he was fuelled by no such need. He'd reacted defensively to their engagement and in retrospect, hadn't really exploited any of the vulnerabilities that the lack of coordination between her and Kazi exposed. He truly seemed to be merely testing them, against their will. But what was this to amount to? Should she make more of an effort to deny him the fight he was looking for? She was faced with precisely that choice, just when Kazi stated that they should take the guy down and as her attack was countered by the Seraph's ever-enduring flames. 'I... I don't know if we can.' she responded, after having swiftly reached such an assessment, based on certain derivations and assumptions. But despite that, Kazi jumped right in, opting to throw a tornado of wind by placing himself behind the angel. While the Seraphim offered his feedback to Akira, he performed a series of swift manouvers to deal with the Sinese. 'Typical. You refusing to accept the circumstance and seek to control it with your winds of change-' he addressed Kazi just as he flung him away, almost dismissively. This forcing Akira, or perhaps his words baited her into using her second trump card, the wand. '-and you defeating yourself with all that second guessing.' he clicked his tongue. He eyed the wand like it was a toy he'd lost when he was a baby. She flicked the head of the wand towards the Seraph, but to know avail, there was no getting a grasp on the higher beings consciousness. She was frustrated, as he continued to offer more wisdom and apparent insight into her circumstances, while he creating another stream of fire. The inferno danced towards her and was relatively easy to dodge, little did she know it was merely a distraction as he used her instinctive movements and his own to swiftly close the distance between them. He struck her wand with his sword, almost playfully, and her own weapon sought to damage her in lieu of being put in danger, fortunately her orb managed to protect her yet again. The Shimada groaned softly as she balled her free hand into a fist, and pushed the sword away with such vehemence that it forced her magic to be channelled into her motion. She couldn't tell if it was her attack or if it was by choice that the Seraph was pushed back by a few meters. Whether he chose it or not, Aki was glad for the space between them. 'What do you want from us?' she asked, through grit teeth. He faintly heard Akira speak about the futility of the battle but ignored it. He was caught in the moment and hopefully they could make some sort of dent the golden armored foe. It was to no avail however as the mage was hastily dealt with. Kaz hit the wall with thud. His body slid down it. Crumbled pebbles rolled over his shoulders and his clothes. His feet touched back at the ground. The angel’s words haunted him. ‘refusing to accept’…’winds of change’ What was it that this being knew of him. For that matter was he really seen as using his wind for change and was that even what he wanted. Those words rattled the resolve of the wind mage as he contemplated what was really driving him. He had to move past that for now. This was no time for a crisis of the mind. He had to get back to his ally’s side. Aki had fought off the attack for now as Kaz re-entered the battle. Her blast stumbled the angel backwards with a grin at the power Akira channeled through her fist. The angel seemed to study the content of the magic that she expelled. Like inspecting a work of art. One of his own creation. Kazimir focused on the attack. If he could get close enough maybe they could launch a dual assault. The Seraphim’s attention fluttered back to the charging wind mage. Gusts blew at Kaz’s heels from the dash. His staff ready at his side to be flung forward with a spell. All for not as the Angel effortlessly veered the sword toward the wind mage’s ribs. There was a darker vexation in the eyes of the angel now. His words stung Kazimir as he struggled with his own feelings of control. The sword sliced into the robes of the wind mage. Kaz’s eyes widened at the metallic intrusion that halted his momentum. The blade trickled with blood flowing down it. The wind mage dropped his staff. Both hands clasped around the blade that was piercing his lower chest. A wound layered atop one that was much older. The Seraphim pulled the sword out like unsheathing it from its scabbard as he spoke about Kaz losing his cool. The mage collapsed to his knees in pain. A strong presence looming over him. The wind around him becoming more tenacious as his emotion faded with the spectral appearance of the white tiger in his aura. The wound was severe but now Kaz only thought of lashing out at the angel with whatever power he had left. The Seraphim circled him for a moment before readdressing the other mage. "The answer to who I am is the same as what I want," He spoke answering Aki's question and the one Kaz asked earlier. His eyes burning brilliantly with unrelenting grandiose. The Seraphim brought his eyes to Akira once again. He flicked his sword clean of the blood and faced it at her, expecting a violent response. One that he was planning for. As soon as Aki would move or took to long to act the Seraphim would point the sword at her parallel to the ground. Then he turned the blade to match the same angle as the scar on her back. The movement would send a sharp pain across Aki as the wound re-opened. He stopped to shake his head with a gentle huff at the pain she felt even though he was the source. The bottom of his blade was bright red with heat. Like it was freshly pulled from the forge. The more the heat spread across the blade, the wider and deeper the wound on Akira eased open. “That wound is your awakening." Akira's eyes widened with a apparent admiration as even in the face of such overwhelming dangers, Kazi picked himself off the ground to garner gentler torrents again. The only time she'd shown such determination was when she was fighting those demons and she barely got away with her life then... Had it not been for the Sinese, the Shimada was convinced that her courage in the face of this fire, would've been far bleaker. She drew her sense of purpose from the lower ranking Knight. She frowned when the words of the Seraph reached her, despite them being directed at Kazi, she too flinched at the seraph's eerie tone. Not just the inflection but the accusation in the content of his assumptions, left her wary. The Shimada was intimately familiar with the process of losing control, somehow she'd never pegged Kazi to be the sort who would face a similar problem. The Seiryu seemed to have a great presence of mind and usually seemed calm and collected. Akira was silly to mentally gloat over the small victory of being able to maintain some distance between the angel and herself. She was even sillier to think that the her partner was safe, just because the Seraph was facing her. When she saw the hilt transition backwards she gasped, but had no chance to warn the victim of the blade. Her grip on the wand tightened, till her knuckles turned as white as her face, once the blood drained from it. She swallowed, and drew a long shaky breath in. The world seemingly stood still, it was like time froze as the sword was slowly plucked out of its target as easily as it had been thrust in. Blood slowly darkened the robes of the fellow mage as it soaked through the fabric. She noticed the way the the winds around him assumed the shape of a tiger, like a spirit animal of sorts... She didn't have time to linger on that sight. The weapon was carelessly brandished, with the purpose of getting rid of the clingy crimson fluid. Her eyes rested on the scarlet spattering that decorated the dirt, she couldn't bear to hold the gaze of Kazi, nor the angel. The Shimada was filled with a profound sense of hopelessness. 'No!' she exclaimed, what started as a violent scream in her head, wound up being issued as a mere and flustered whisper of dejected denial. The realisation was slow to hit her and it was horrifying... She had a part in knocking the blonde away, towards her partner. 'I'm- I'm sorry.' she mouthed, her words lost in the air of the night. As emotions overwhelmed her, it got more and more difficult to channel her magic into anything cohesive and their tormentor was still being cryptic. But in a moment, it wouldn't matter. She narrowed her eyes and widened her stance, balling her hands into a fist as she allowed rage to blind her. Just as she was about to make a dash towards him, with no particular plan in mind, he held up the sword, pointed menacingly towards her. 'Be done with it then.' she taunted, if he wanted their lives, it was apparent that there was no stopping him. She noticed the slightest shake of his head, as though he was mildly amused by her suggestion and implication, before he uttered a single word. She barely had a chance to comprehend it, before she was overwhelmed by a cruel sensation. She was acutely aware of the origin of the pain, it was a very sharp line that ran across her back, from her right shoulder to the left hip, crossing the scar left by the demon. Instead of the loud screech of pain that the demon had elicited, this time, the Shimada merely hissed. However, while she was able to show some restrain vocally, the attack did evoke a physical reaction that was very similar to Kazi's. The young girl's legs gave way and she was forced to her knees as well. Her teeth grit and her muscles strained in the exertion as she dealt with a pain that wouldn't vanish, like an ordinary slice would. She groaned, the echo of which drowned out most of what the seraph said, but the words buried their way into her subconscious and unbeknown to her, precipitated into information that allowed her to gain clarity on what exactly had transpired. On how she had gained the power she now had. Her conscious mind was still reeling from the fact that she was never physically struck and yet here she was, suffering. There was no respite from the pain, she felt the hot fluid stain her own clothes now, but there was no tear in the garment. There they were, two Knights kneeling for a being against their will. There was no salvaging the people of the world when such power existed. The bright glow from the weapon, was unbearable to witness along with all the searing agony from the wound. She clenched her eyes shut and sat back on her heels... defeated and in grudging surrender. An invisible shockwave of energy spread outward from every pore of her body, it blew away more pieces of the withering church, but with one swish of the sword, the angel remained unharmed and Kazi too, was protected from any further injury. The Seraph turned to Kazimir, the tip of his sword tucked under the wind mage's chin. There was nothing violent about the gesture this time. He simply aided the man by allowing him to prop his face against the weapon. 'You too, must awaken. For it is the only hope for you to control the Tempest instead of the other way around.' he stated. rather simply this time. Little did they know, awakening was only the first part of this tryst. Once the two learned and realised of the potential of their respective magics, they were to be blessed to harness their power. The Seraph disregarded the unseen shockwave that rippled violently outward from Akira. The old temple walls and columns splintered from the sheer force of it. The Seraph still stood unwavering. "That is good Akira. You finally understand a bit more. You see how futile things can be." The angelic being seemed to revel in the despair that he caused. Even to hear the faint whisperings of Akira about the dire situation and her concern. While the angel focused on Akira, Kazimir looked down at the blood saturating his clothes and dripping to the ground. He was not worried though. It was an emotionless calm that came over him. His body moved on its own. Disregarding the damage it had taken as he staggered back to his feet, only to fail to his knees once more. The world around him faded and there was only the hunt left. The tip of the seraph's sword found its way back to the wind mage along with belittling words. The angel spoke of controlling the storm. Something that rang in the now deep recesses of Kaz's thoughts. The angel of wrath walked an equal distance between the two and turned to face them. One could draw an even triangle between the three of them. All equal distance away from one another. The only difference was the two beaten knights on their knees and the Angel towering above them. His wings unfurled once more to reveal his majestic stature. "Now you are ready. Ready to release the shock waves when light meets dark," he said as he looked up to the heavens, "Ready to summon the tempest." The clouds above them began to swirl slowly but neither of them felt any wind. Fire danced down his blade. His eyes burned with the same fire that now wove its way through each feather in his open wings. He pointed the sword between the two mages. “My will is unyielding. My flame guides the blessed. An inferno that burns down all barriers,” his eyes facing the still kneeling mages. Their souls felt his power tugging on them. Their wounds no longer bleed or exuded pain. Yet they still felt an immense pressure. One that kept them stationary. It was inescapable. “I give unto you sight,” his words caused a flash of visions within the two. One that seemingly showed a deeper truth to the magic they wielded. A thinly veiled secret becoming visible if only for an instant. “I call upon my own divinity. 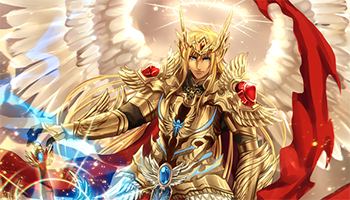 The flame of rebirth and wrath,” his wings remained unchanged, but thousands of feathers soared from them, still covered in his heavenly flame. The feathers surrounded the mages and created the visible image of a triangle that connected them. The feathers circled them and erupted. They were engulfed in a ruby pillar of fire, but it did not burn their bodies. Their spirits were set ablaze and their breath was almost stolen. Streams of fire flicked back and forth between the mages and the Seraphim. The angel thrust his sword into the ground and melted the rock as it entered. The streams of fire became laced with golden flickers of flame pouring out from the angel. The pillars of fire raged around them and focused more intensely on the wounds that the Seraph had opened. The ruby fire mingled with golden fire born of the angel. The pressure was overwhelming as their souls were invigorated by a powerful and divine presence. Within the ruby and golden fire their bodies were rejuvenated from the battle. Their wounds healed. Their eyes illuminated by golden rings. The feathers burnt to cinders around them one after another. If the mages looked at each other, for a moment they could see the faint outline of angelic wings on each other. Looking down they could see the image of their own wings mirrored in the reflection of their shadows. Its wing shape scorched into the ground. He looked on in awe and fear as the feathers ensnared him. As the fire engulfed him he struggled to breath. The divine power burned around him and he felt his soul growing hot. Until there was a moment of stillness. Of power that tingled his fingertips. He looked over in panic only to see Akira in the same immolation as he. He would think this was the end for them but it was infusing them with something. A feeling more alive than he had ever felt. Aki never wore the garb of helplessness well, yet it was thrust upon her far more often that she would like. They were outmatched. She wondered if they'd opted to head into their mission on another night, would things have turned out differently? Given the information the angel possessed about the two, it would seem not. His actions seemed premeditated, like he'd been lying in wait for his chance like this. He'd have stirred into the prowl, if not today then another day, the seraph was clearly accustomed to getting what he wanted and had the prowess to ensure it. Had she not already been reeling from the pain of her freshly opened wound, she'd have noticed the ache in her knees. Nonetheless, the weakness in her form as she fought the brutal sensation, forced her to fall further onto her palms, her head rose to notice the Sinese faring only slightly better than her. The Shimada had already surrendered and the stab had now forced Kazimir to do so too. Clearly, it wasn't death that was in store for them, although the Shimada was close to wishing for it. He strode to his vantage point, Aki craned her neck to follow his movements with her gaze, not that it mattered, but there was an illusion of security in knowing where the enemy was. Within seconds the flare of bright glowing embers from his wings, forced her to squint and avert her eyes. His voice echoed deeply as he addressed the two. It seemed as though they had been forced into a ritual of sorts. If Akira's wits hadn't been as scattered as they were, she'd have recognized it from her ample reading and research. Not that prior knowledge would allow her to change anything... Nothing would. His sword now stood between the two, like a wall. She could no longer make out details of Kazimir's features, but assumed that he was as incapacitated as she was. She closed her eyes in an attempt to curb the strange stirring within. It was almost as though something wanted to leap out from her, towards the blade. She sincerely didn't want to risk another shock-wave exploding from her. Control had to start with the ability to restrain. Despite her lids being clamped shut against the assault of the brightness, in stark contrast to the dark night, she saw a splash of black and white collide violently - into seeming nothingness within. His words and the conjured vision offered her all the insight she needed, to at least explain what she had been left with. She opened her eyes a crack, to notice the flames that engulfed them, the heat scorching, but harmless. Additionally, it etched a link between the three. Of course, there was more to come. More fire, more heat... She wasn't sure if it was the lack of oxygen from all the combustion or something else, that left her panting for breath as the pillar of flame rose under her. She pulled herself back onto her knees, only to fall back onto her calves. Dwindling, she waited. It would seem, that the stab and slash were point of entry, for the heavenly power to seep into their forms. By now, she had finally made the connections and knew what was to come before the Seraph was oh-so-kind to explain. Her eyes met Kazimir's, she did all she could to wipe the plaintive apology that they'd shown earlier. The Shimada now remained impassive and resigned. Her eyes didn't flit to the smoldering shadow on the ground, she didn't need the change in her to be attested by sight, she was well aware of what had transpired. After the overwhelming surge of power and vitality, she felt quite empty again and exhausted. The feelings contrasted sharply. She slowly picked herself up, dragging her leg as she slowly found footing again. The Shimada teetered and sighed. This put her in an odd predicament. Perhaps, for the time being she could use it to curry favors with the church, maybe this curse... or rather blessing was indeed a blessing in disguise. 'I guess we'll be seeing more of you then.' she stated, her voice was raspy. Surely, if he had found them once, he could find them again, perhaps with more ease given the divine essence inside them. She'd learned much today, despite the hefty price. It would seem Kazi had his own inner battles too, unfortunately, she wasn't in the position to aid him. The fact that they had just been forced to be disciples, only made her want to stay away from the fellow Knight for his safety and for the sake of her duty. This power was going to be yet another tool she'd have to learn to wield... The Shimada had too much on her plate. She nodded towards the Sinese, an anticlimactic gesture given everything they had endured. As the pain from the injury she had sustained finally began to fade into a gentler throb, she sighed softly. The brilliance that the angel of wrath exuded slowly faded too, and he assumed a more human form, apart from the scattered debris, the scene was exactly like it had been before the ritual - it was almost like it didn't happen. If only. 'I'll be on my way now, I trust I'll be easy to find if needed. For now, I do hope I can be extended the courtesy of solitude.' she addressed them both and no one in particular. If no one offered a reason to stop, she'd hobble away, not towards the church but to her apartment instead, she was going to need a few days to process this change and to find a way forward. Hopefully, there would be nothing that'd prevent her from doing at least that. The fire engulfing the mage was fierce but it left no burns on his skin. A rush of power surge through him. A divine power. The unwanted and forced blessing of the angel of wrath. The power flowed into the wound on his chest. The fires and feathers whirled around his body until there was nothing but silence. His knees still buried in the debris covered ground of the old church ruins. Ash covered the ground around both himself and Akira. His pain was gone and a single flaming feather floated in front of him. If he had not been fueled by rage he would have reached out to it but instead he let it burn to cinders on the ground. Divinity roared to life within him. A vision of whirlwinds clashing together and standing in that eye of the storm was the white tiger. The animal that plagued his magic and his mind. It was as if primal instinct was challenged by wrath. I forced vassalage to a divine power. To the angel that had descended upon them, giving them no other choice. Kazimir's mind raced with empty thoughts. Not knowing where to look or what to do. For the first time he was truly lost. His heart beat fast as he tried to capture his breath. his hand running over the newly carved scare in his chest. One that resembled the pain that Akira's held. Snapping out of his vision and contemplation, as usual Aki had composed herself. She politely excused herself from the situation. Asking only for time to contemplate. Without a word Kaz almost reflexively nodded but his mind was on his own problem. A part of him did worry more about her now. Her road was a twisted and warped one complicated even more now. As she left he couldn't help but feel a strange bond between them. One that connected their divine blessings. Almost as quickly as Aki departed, so to did the angel. Leaving without any words to go on. No direction to be followed. And the quest to stop the secret cult was over just like that. It was now becoming a habit for him to fail in the presence of Aki. He stood up and gathered himself. Dusting off the clothes he wore. His body felt better than it had ever and he felt the blessing in his soul. A pull toward doing good deeds, but it was more than that. With it came a mountain of confusion. He would also need time to come to terms with this path. To reconcile the things that plagued him, and understand this new gift or curse. He turned away from the ruins to leave it behind. He began to walk away when he about faced for one final thing. He circled is arms once more, "Whirlwind of the white Tiger," he conjured a violent tornado that knocked the debris away along with the feathers and the ash. Leaving behind no remains of the ritual that took place here.